The Cherry Blossom cycle took place despite dire forecasts for heavy rain and the possibility of very few blossoms still being out there due to our very mild winter and early spring weather. It was a joint activity for both VOA and North Shore Hikers (NSH) members. We had 5 participants from VOA and 4 from NSH. As it was not raining at the start time the cycle went ahead. Our route took us from Park Royal over the Lions Gate Bridge to Park drive with a stop to see the nesting Blue Herons behind the Parks board offices in the Westend. We then continued along Beach Ave. and around False Creek to the Starbucks at Cornwall and Cypress for coffee. After coffee we headed up the Cypress bike route to 59th Ave. and then east to Heather St. and then south to the transit bridge to Richmond. From there we made our way mostly along River Road and the dyke to the Olympic Oval. After lunch it was back to the transit bridge and then up Heather St. all the way to the Cambie Bridge which we crossed and then took the Dunsmuir bike route through town to Coal Harbour and Stanley Park where we shortcut via Pipeline Road to access the Lions Gate Bridge and back to Park Royal. Our distance was about 60 Km. for the day. I shortened the route due to the, at times, fairly heavy afternoon rain. 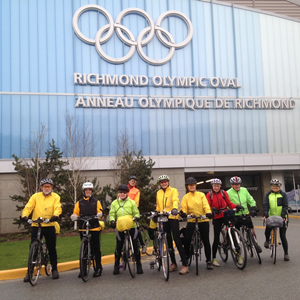 Luckily the rain held off until after a very enjoyable lunch at the Olympic Oval after we found the front entrance. Most of us had a mini-tour after eating lunch as many had not ever been inside this very attractive Olympic venue building. It was rain gear time after lunch and we took a break at 16th and Heather at the Tandem Cafe but although the bike store part was open for business, the cafe was closed as it was the good Fri. holiday. They sent us down the street to a bakery/coffee shop at the corner of Willow and 16th who looked after us very well. The 59th Ave. and Heather St. sections of the ride as well as other areas in Stanley Park and in Richmond did produce many wonderful Cherry blossom trees along the boulevards. To see this wonderful Vancouver floral display while cycling the very well marked and planned bike routes is really a treat! By the time we returned to Park Royal the rain had stopped so not a bad day for an urban cycle!